Happy Khambule set off for the COP19 world climate change conference in Warsaw, Poland. This Constantia resident is part of a youth delegation of climate activists and is a policy intern at Project 90 by 2030 in Kenilworth. This non-government organisation advises and guides South Africans about how to slash their carbon emissions. Mr Khambule focuses on energy policy and local-provincial-national governance. Eloquent and inspiring, Mr Khambule grew up in Soweto and had dreams of becoming a judge so it is not surprising that he studied law at the University of Johannesburg. He is now studying for a master’s degree in Environmental Law. 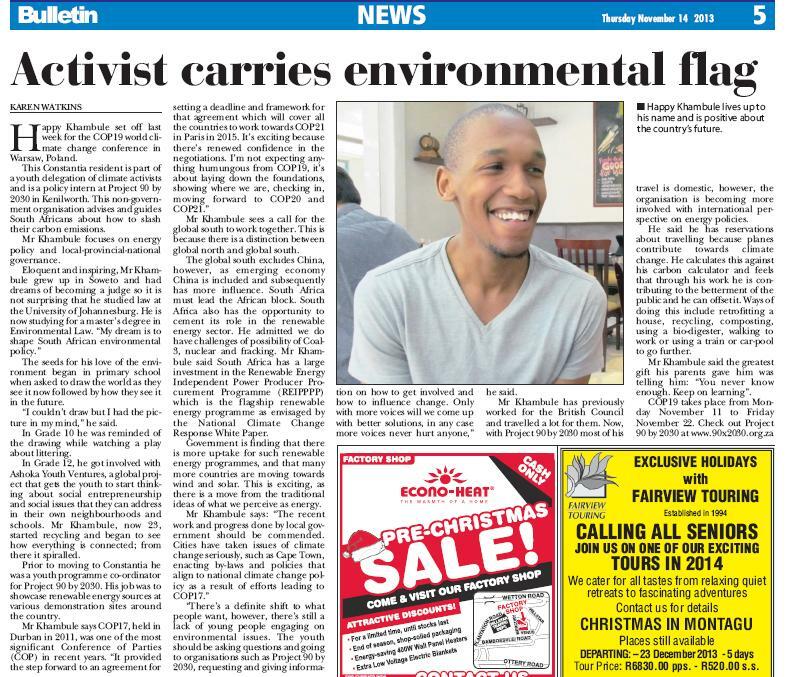 “My dream is to shape South African environmental policy.” The seeds for his love of the environment began in primary school when asked to draw the world as they see it now followed by how they see it in the future. “I couldn’t draw but I had the picture in my mind,” he said. In Grade 10 he was reminded of the drawing while watching a play about littering. In Grade 12, he got involved with Ashoka Youth Ventures, a global project that gets the youth to start thinking about social entrepreneurship and social issues that they can address in their own neighbourhoods and schools. Mr Khambule, now 23, started recycling and began to see how everything is connected; from there it spiralled. Prior to moving to Constantia he was a youth programme co-ordinator for Project 90 by 2030. His job was to showcase renewable energy sources at various demonstration sites around the country. Mr Khambule says COP17, held in Durban in 2011, was one of the most significant Conference of Parties (COP) in recent years. “It provided the step forward to an agreement for setting a deadline and framework for that agreement which will cover all the countries to work towards COP21 in Paris in 2015. It’s exciting because there’s renewed confidence in the negotiations. I’m not expecting anything humungous from COP19, it’s about laying down the foundations, showing where we are, checking in, moving forward to COP20 and COP21.” Mr Khambule sees a call for the global south to work together. This is because there is a distinction between global north and global south. The global south excludes China, however, as emerging economy China is included and subsequently has more influence. South Africa must lead the African block. South Africa also has the opportunity to cement its role in the renewable energy sector. “There’s a definite shift to what people want, however, there’s still a lack of young people engaging on environmental issues. The youth should be asking questions and going to organisations such as Project 90 by 2030, requesting and giving information on how to get involved and how to influence change. Only with more voices will we come up with better solutions, in any case more voices never hurt anyone,” he said. Mr Khambule has previously worked for the British Council and travelled a lot for them. Now, with Project 90 by 2030 most of his travel is domestic, however, the organisation is becoming more involved with international perspective on energy policies. He said he has reservations about travelling because planes contribute towards climate change. He calculates this against his carbon calculator and feels that through his work he is contributing to the betterment of the public and he can offset it. Ways of doing this include retrofitting a house, recycling, composting, using a bio-digester, walking to work or using a train or car-pool to go further. Mr Khambule said the greatest gift his parents gave him was telling him: “You never know enough. Keep on learning”. Printed in Constaniaberg Bulletin Newspaper.